In a small bowl, stir together 1 cup sugar, 1/3 cup flour and 1/2 teaspoon cinnamon. In a large bowl combine the apples, cranberries (reserving 1 cranberry for the garnish) and 1/2 cup walnuts. Sprinkle sugar mixture over the fruit. Toss to combine. Spoon mixture into pastry-lined pie plate. Dot with butter. Cut slits in remaining pastry to allow steam to escape. Place pastry on filling. Trim both overhangs to an even 1 inch all the way around. Tuck the crusts under and flute the edges. Lightly brush pastry with a little milk and sprinkle with additional sugar. Cut a slit in center of pastry; place the 1 reserved cranberry in slit. Sprinkle the 1 tablespoon walnuts around the cranberry. To prevent overbrowning, cover edge of pie with foil. Place pie plate on middle shelf in oven; place foil-lined baking sheet on lower rack beneath pie. Bake in a 325 degrees F. oven for 1 hour. Remove foil. 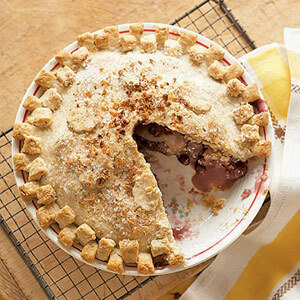 Bake 30 to 45 minutes more or until fruit is tender, filling is bubbly and crust is golden brown. Cool on a wire rack at least 2 hours before serving. Makes 8 servings. In a large bowl, stir together cake flour, all-purpose flour, and salt. Using a pastry blender, cut in butter and shortening until pieces are pea-size. In a small bowl, stir together 6 tablespoons of the water, egg and lemon juice. Using a large fork, gently toss the flour mixture and egg mixture together. If there are any dry parts add the remaining 1 tablespoon of water and gently toss to moisten evenly (should be a mass of very large crumbs). Turn crumb mixture out onto a lightly floured surface. Using your fingers, gently form a ball. Using just a bit of flour, knead 4 to 5 times to form a ball. Divide in half. Using your hands, flatten each into a disc about 1 inch thick. If necessary, wrap the dough in plastic wrap and chill in the refrigerator for 1 to 2 hours or until easy to handle. On a lightly floured surface, roll 1 disc of dough from center to edges into a circle 12 inches in diameter. To transfer pastry, wrap it around the rolling pin. Unroll pastry into a 9-inch pie plate. Ease pastry into pie plate without stretching it and gently fit pastry into dish. Roll remaining dough disc into a circle 12 inches in diameter. Cut slits to allow steam to escape. Place pastry on filling. Trim both overhangs to an even 1 inch all the way around. Tuck the crusts under and flute the edges. To prevent overbrowning, cover edges with foil. Bake as directed in individual recipes. Makes 2 pie crusts.